The perfect meal, the right decorations, some light music, and the standout kitchen wares and serving pieces. For hosts who adore the art of entertaining, all of these elements are part of the show you arrange for your close friends and family. Thanksgiving is the perfect time to debut your new pieces — and we’re here to help with some kitchenware you’ll love. We’ve put together this shopping guide to highlight some of our most-beloved kitchen wares that you just might want to include in your Thanksgiving dinner. Get inspired and start shopping! A loving throwback to the décor of decades ago, this stunning pedestal cake stand can be used for serving dessert or even presenting the main course. 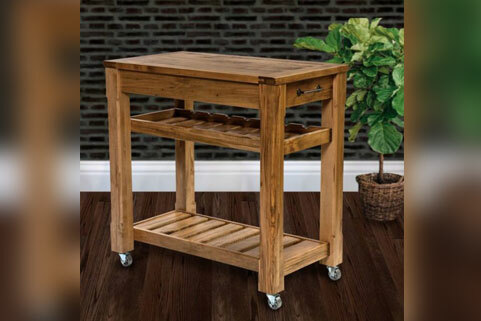 The rustic finish combines with the strong lines extending from the base to form a one-of-a-kind style. In addition to the knockout look, this piece allows for multi-tier serving, making your table cleaner and easier to manage. One of the most popular items crafted by Martin’s Furniture, this centerpiece sees use in homes and upscale hotels alike. A popular serving showpiece for musicians and music aficionados alike, this stand boasts a big personality. 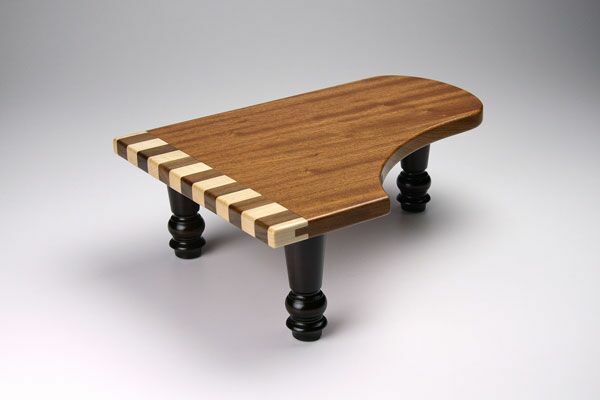 Smoothly cut and stained to resemble a grand piano, this stand is most often used for serving cheese plates or other hors d’oeuvres — and for kick starting the conversation. 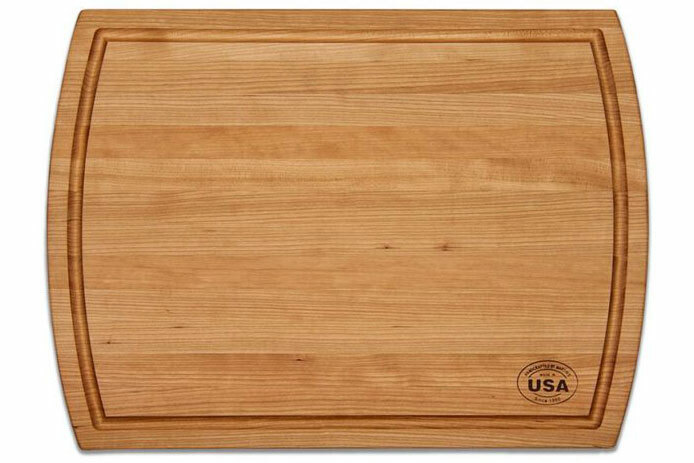 Like most of our kitchen wares, this piece is made with an FDA-approved food grade finish. See the baby grand sister-piece of this cake stand. Love it for the look — and appreciate it for how convenient it makes tableside serving. 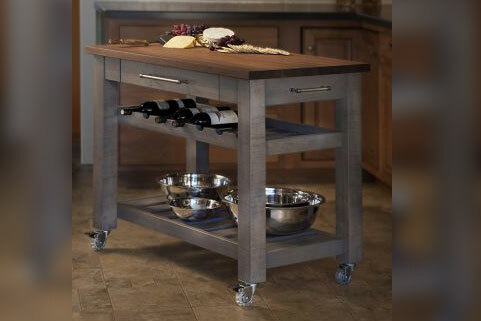 This mobile kitchen island is meant to function as your everything for prep and serving. You can carve your turkey in the kitchen and wheel the whole island into the dining room for maximum wow-factor and ease. In addition to that, the shelving and wine rack make it perfect for almost any type of dinner party. While most hosts love this for the utility, the style doesn’t disappoint — far from it, in fact. This knockout piece grabs attention for the urban gray finish and strong modern lines. This piece also comes in other striking shades — see them here. All of the same benefits of the Metro Island in a completely different visual aesthetic. This piece is so distinct thanks to the Ambrosia Maple wood. Ambrosia Maple is one of the most unique species of lumber, and consequently, every Alchemy Kitchen Island we sell is truly unique, too. Another reason behind the popularity of the Alchemy is that the honey oak color is a common match for dining room tables — and it makes for perfect visual symmetry. A handmade piece of woodwork is a subtle method to express your personality. If you want to be less subtle, consider our personalized serving trays. These gorgeous tobacco-colored wooden trays are perfect for bringing after dinner coffee, tea, and dessert to the table — not to mention they’ll definitely catch some admiring eyes. 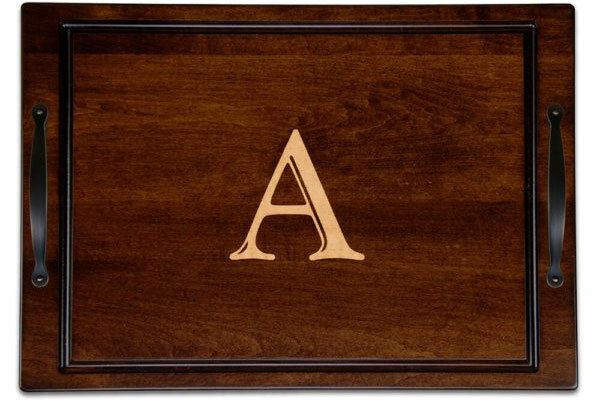 We can personalize these pieces with a letter, a monogram, or up to three lines of text that mean something to you. 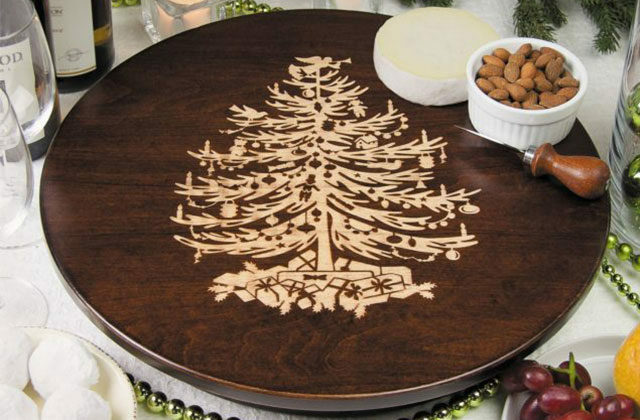 A piece of woodcraft can take you back to a simpler time, like the feeling of Christmas or Thanksgiving in your childhood. That loving twinge of nostalgia was the inspiration behind this head-turning piece. 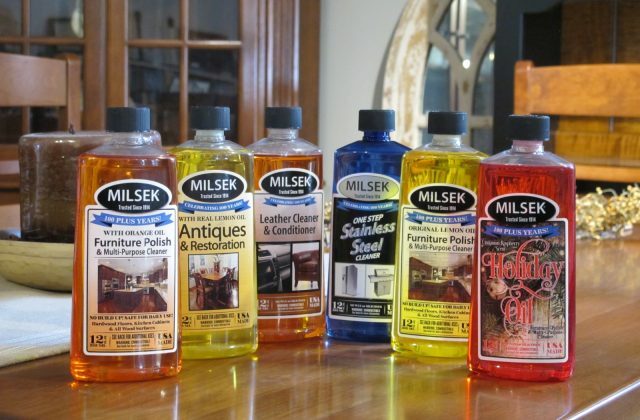 We want you to harken back to simpler times and make memories for your own children. 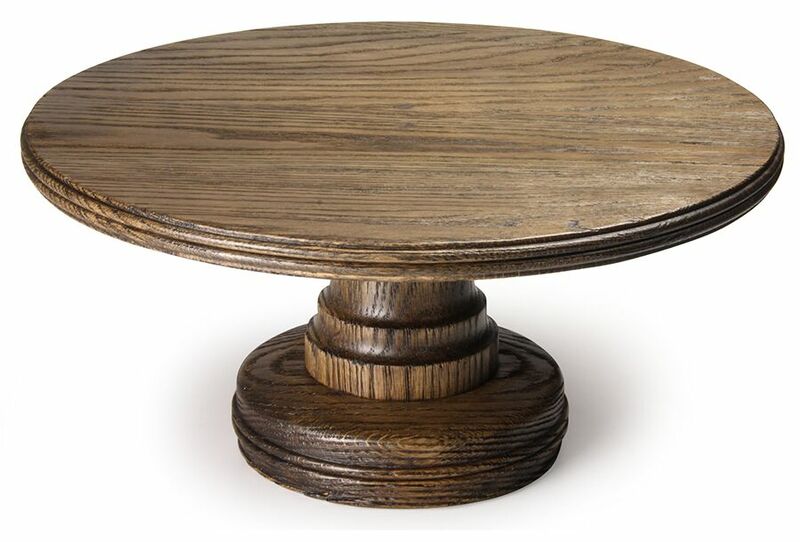 This delicate yet strong Lazy Susan sits in the middle of your table and makes sharing your entrée easy. Experienced hosts love pieces that accomplish two things at once — while looking great, too. 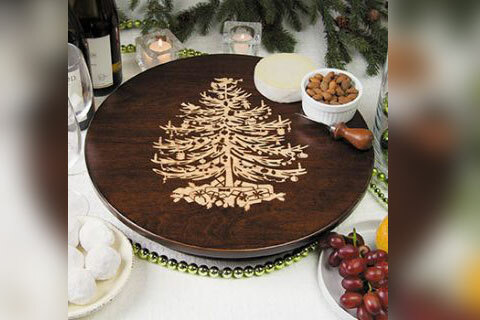 We craft these reversible carving boards for anyone playing the host. The cutting surface of the tray is made from a handsome cherry hue that alone would make this carving board a winning piece. However, this piece makes headlines thanks to its scooped out base. You can flip this piece over to use as a modest serving bowl. While it isn’t necessarily in the Thanksgiving spirit, these trays are a huge hit when served with shrimp, as the bowl is perfect for the tails. While our handmade pieces are meant to provide you years of blemish-free presentation, they are conversation starters as well. Find the piece — or pieces — that speak to you, and that you can’t wait to include when you bring the family together. Love the Martin’s Furniture style and attention to detail? We love being a part of your family and friend gatherings and get-togethers. If you want to see some of our stunning homewares in-person, visit our showroom in Lancaster County, Pennsylvania. While you’re visiting with us, you can also explore our wide selection of handcrafted furniture, built with the same adoring attention to detail. Contact us with any questions, to place your order, or to arrange a visit.